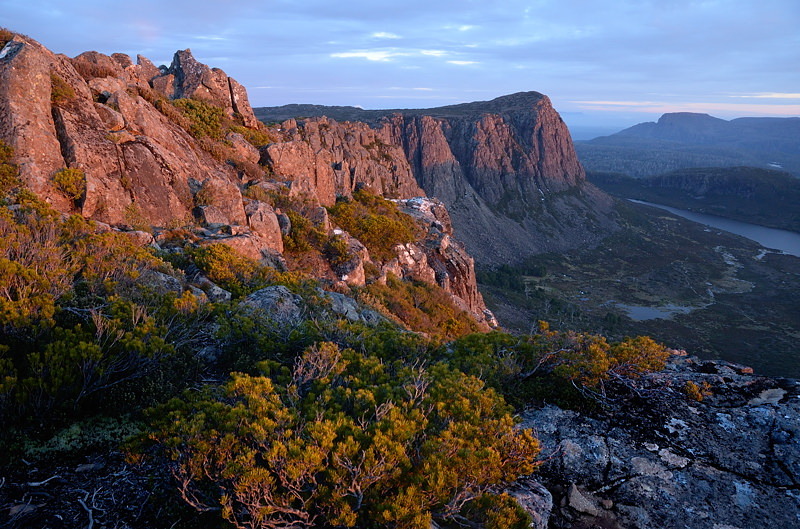 There are some interesting suggestions from Parks and Wildlife about how the Walls of Jerusalem should be managed in future. The area is certainly quite heavily used, and they've been trying to work out how to minimise the impact of the number of visitors for some years. There's a pdf you can download with all the details. Perhaps most notably, they propose a circuit walk in through Herods Gate, over to Dixons Kingdom, then down to Lake Ball and then Lake Adelaide and return from there. I will note one item I have come across in the report. At one point, in talking about the use of the area by large non-commercial groups, it notes "Anecdotal reports have also noted the poor social conduct of some large groups, their lack of adherence to an appropriate code of practice and general lack of understanding as to the sensitivities of the environment in which they are bushwalking." This may be true, but I have encountered the well-known local school groups who take both primary and secondary students for daywalks from the Arm River campsite. The last group I saw were beautifully behaved, friendly and cheerful, led I think by Aardvark Adventures, and were enjoying the landscape. Mr Aardvark, the boss I think, correctly identified me to the group as a specimen of a Whiskered Tasmanian Bushwalker. I think we're a sub-sub-sub-species... Homo sapiens tasmanicus perambulatus-sylvanus barbarius? We are building an extensive database of Australian and New Zealand bloggers. Can you please tell me where you crossed the never never. I'm up next month and am scratching my head. Tony, see my blog post here http://tasbushblog.blogspot.com.au/2013/02/through-never-never-15th-january-2013.html. If you want a GPS track, I'll see if mine is usable. There's another one available on the net if you ask the right bloke. I think his had better reception than mine.